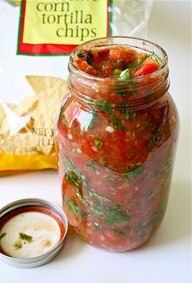 I have a couple other recipes for homemade salsa, but decided I better save this one too when I saw it on facebook today. It looks really easy and good. Chop 5-6 Roma tomatoes,1 small onion and 1/2 cup fresh Cilantro. Mince 2 seeded Serrano or Jalapeño peppers and 1 clove of garlic. Add 2 tbsp. freshly squeezed lime juice and salt and pepper to taste. Mix everything together and let sit overnight for flavors to meld.